Healthy Loser Gal: Make RESULTS, Not Excuses! I absolutely have a crush on Dolvett Quince, the new trainer from Atlanta on Biggest Loser Season 12. I mean, c'mon! Have you seen the man training people on the Red Team? Have you checked out those abs and that smile? To me, though, the most charming thing about this guy is his personality and inspiration. I am lucky to have sought him out on Twitter a few weeks ago before he had 20K+ followers and tweeted with him a little bit, so today I tweeted and asked him for his okay to use his great quote from last night's show... see below! So there you go, friends! We have a theme for the 90 Day Gift of Fitness & Health Challenge. When you're feeling like you're too tired, don't want to get out of bed to walk or run, don't want to eat healthy when the fast food drive-in is on your way home, think of this: "Make RESULTS, not excuses!!" I have a crush on him also. I would love to be trained by him. 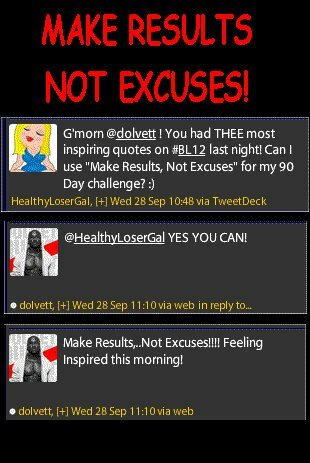 I was so worried about Jillian being gone this year and I adore Bob but I think Dolvett would be an awesome training.